A thorough cleaning may produce some bleeding and tenderness or discomfort around the gums. This should subside in a day or two. If this persists 2-3 days after the cleaning , you may help the child rinse with warm salt water a few times per day. For discomfort you may also give your child Children’s Tylenol, Advil, or Motrin as directed for the age and weight of your child. Your child will spit out the excess fluoride but cannot rinse, eat, or drink anything for 5 minutes. No more 30 minute wait, Yay!!! 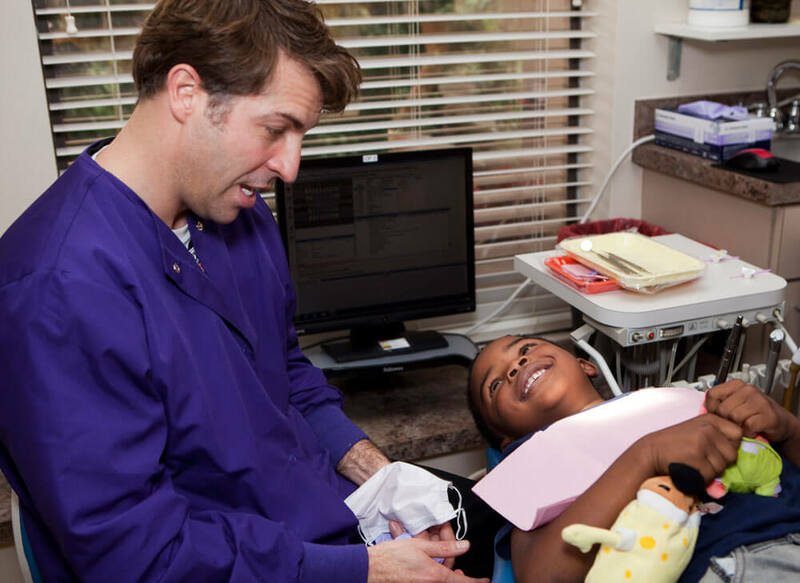 We will instruct you to not have your child brush that night, as we want the fluoride to stay on the teeth, absorbing into the cracks and grooves of the teeth, making your child’s teeth stronger and more resistant to cavities. They will resume regular brushing in the morning. After a sealant is placed, your child may feel the coating on their teeth and feel different when they bite down. This is normal and should subside after a few days. Please keep in mind that sticky foods or candy or chewing on ice could dislodge a sealant but that most sealants should stay in place for many, many years…if not forever. Your child’s teeth, lips, cheeks, and maybe their tongue will be numb for at least one hour. Please keep in mind that each child’s numbness time can vary. Dr. Nathan will tell you exactly and go over this. Have your child wait at least one hour before eating anything that requires them to chew. They can immediately have something to drink but may drool some. This is normal. Unless otherwise stated, it is safe for your child to drink through a straw. Remind your child to refrain from biting, picking, scratching, sucking, or playing with the numb areas, as this could cause sores or pain later. Your child should be fine to resume all normal activities if they are numb. As always, please don’t hesitate to call us if needed. Some tooth and gum tissue manipulation was necessary to perform a filling and may result in sensitivity or discomfort. Should this occur, you may give your child Children’s Tylenol, Advil (ibuprofen), or Motrin as directed for the age and weight of your child. Please call us if needed or if you have any questions. Some tooth and gum tissue manipulation was necessary to place a crown and may result in sensitivity or discomfort. Should this occur, you may give your child Children’s Tylenol, Advil (ibuprofen), or Motrin as directed for the age and weight of your child. Please avoid sticky candy and foods that could pull a crown off the tooth. If a crown does happen to come off, keep the crown and bring it to our office. Please call us if needed or if you have any questions. Some tooth and gum tissue manipulation was necessary to perform this procedure and may result in sensitivity or discomfort. Should this occur, you may give your child Children’s Tylenol, Advil (ibuprofen), or Motrin as directed for the age and weight of your child. Please call us if needed or if you have any questions. There will be a small hole in the gums where a blood clot will form as this area heals. It could look whitish or grey. This is normal. Some gum manipulation was necessary to perform this procedure and may result in sensitivity or discomfort. Should this occur, you may give your child Children’s Tylenol, Advil (ibuprofen), or Motrin as directed for the age and weight of your child. Have your child keep their fingers out of their mouth and away from the area. If unusual or sustained bleeding occurs, place WET cotton gauze firmly over the extraction area and have your child bite down or hold in place. Repeat as needed until the area is no longer bleeding. Keep in mind that your child may be numb causing them to drool, thus making it look like more blood than it actually is. This too is normal. Maintain a soft diet for a day or two or until your child feels comfortable eating normally again. Unless otherwise directed by Dr. Nathan, your child should be fine to drink through a straw with the extraction of a baby tooth. Please call us if needed or if you have any questions. There will be a small hole in the gums where a blood clot will form as this area heals. It could look whitish or grey. This is normal. DO NOT ALLOW YOUR CHILD TO DRINK THROUGH A STRAW FOR 24 HOURS AND HAVE THEM REFRAIN FROM DOING A LOT OF SPITTING AND RINSING/SWISHING. This could disrupt the blood clot formation. Some gum manipulation is necessary to perform this procedure and may result in sensitivity or discomfort. Should this occur, you may give your child Children’s Tylenol, Advil (ibuprofen), or Motrin as directed for the age and weight of your child. Have your child keep their fingers our of their mouth and away from the area. If unusual or sustained bleeding occurs, place wet cotton gauze firmly over the extraction area and have your child bite down or hold in place. Repeat as needed until the area is no longer bleeding. Keep in mind that your child may be numb causing them to drool, thus making it look like more blood than it actually is. This too is normal. Maintain a soft diet for a day or two or until your child feels comfortable eating normally again. Please call us if needed or if you have any questions. There will be a small hole (and maybe stitches) in the gums where a blood clot will form as this area heals. It could look whitish or grey. This is normal. DO NOT ALLOW YOUR CHILD TO DRINK THROUGH A STRAW FOR 24 HOURS AND HAVE THEM REFRAIN FROM DOING A LOT OF SPITTING AND RINSING/SWISHING. This could disrupt the blood clot formation. Some gum manipulation was necessary to perform this procedure and may result in sensitivity or discomfort. Should this occur, you may give your child Children’s Tylenol, Advil (ibuprofen), or Motrin as directed for the age and weight of your child. You may be given prescription antibiotics or pain medicines for this procedure. Please take those as directed by your dentist. Have your child keep their fingers our of their mouth and away from the area. If unusual or sustained bleeding occurs, place wet cotton gauze firmly over the extraction area and have your child bite down or hold in place. Repeat as needed until the area is no longer bleeding. Keep in mind that your child may be numb causing them to drool, thus making it look like more blood than it actually is. This too is normal. Maintain a soft diet for a 1-3 days or until your child feels comfortable eating normally again. Please call us if needed or if you have any questions.